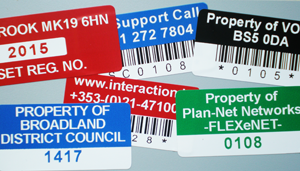 Design your own asset labels using the top quality vinyl material. Our asset marking vinyl labels have a 0.05mm thickness well suited for identification and asset labelling. Plus they use a very strong acrylic adhesive that will adhere to a wide range of surfaces and can be used both indoor and outdoor. These asset labels are resistant to heat from -40°C to +100°C. Our solid printing process protects the label image from abrasion and solvents and is suitable for printed images such as a barcode and also coloured text. What are Vinyl Asset Labels? Vinyl Asset Labels are permanent labels/stickers that you can place on valuable equipment or assets to show your ownership of the item. By including sequential numbers and or a barcode or QR code you can also track identical items more easily and keep records of not only who is responsible for each item, but also its value to your company or organisation over its lifetime. Vinyl labels are a good choice because they can be used both indoors and outdoors plus the material is super tough so they will last a lot longer.